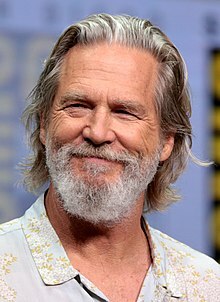 جف بریجز (اینگیلیسجه: Jeff Bridges) آمریکالی موغنی, فیلم یاپیمجی‌سی و اوْیونچو. کالیفورنیا ایالتینده دۆنیایا گؤز آچیب. 1951–گۆنوموز ایللر آراسیندا سینما ساحه‌سینده چالیشیب. 1973 The Last American Hero Elroy Jackson, Jr.
2017 Kingsman: The Golden Circle Champagne "Champ"
1965 The Loner Bud Windom Episode: "The Ordeal of Bud Windom"
1969 The F.B.I. Terry Shelton Episode: "Boomerang"
1969 Lassie Cal Baker Episode: "Success Story"
1970 The Most Deadly Game Hawk Episode: "Nightbirds"
1981 Great Performances Michael Loomis Episode: "The Girls in Their Summer Dresses and Other Stories"
1983 Faerie Tale Theatre Claude / Prince Episode: "Rapunzel"
1983 Saturday Night Live Himself (host) Episode: "Beau Bridges and Jeff Bridges/Randy Newman"
2010 Saturday Night Live Himself (host) Episode: "Jeff Bridges/Eminem and Lil Wayne"
↑ ۱٫۰ ۱٫۱ Chart News August 24: Country Dominates as Luke Bryan Still Top Dawg. Roughstock. آرشیولنیب اصلی نۆسخه‌دن on November 4, 2011. یوْخلانیلیبAugust 24, 2011. ↑ ۲٫۰ ۲٫۱ خطای اسکریپتی: پودمان «WLink» وجود ندارد./chart-history/ Chart listing for Jeff Bridges. Billboard. Prometheus Global Media. یوْخلانیلیبAugust 25, 2011. اینگیلیسجه ویکی‌پدیاسی‌نین ایشلدنلری طرفیندن یارانمیش«Jeff Bridges»، مقاله‌سیندن گؤتورولوبدور. ( ۲۲ ژانویه ۲۰۱۸ تاریخینده یوْخلانیلیبدیر). قارداش پروژه‌لرده جف بریجز گؤره داها آرتیق بیلگی‌لر تاپابیلرسینیز.